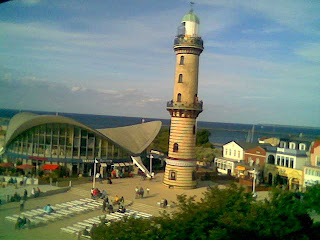 Rostock is an old Baltic harbor city with a long seafaring tradition, and a lot of sites of interest. 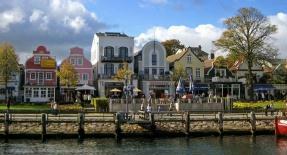 But the nicest thing about it is its closeness to the nearby beaches, in its resort area, Warnemünde. 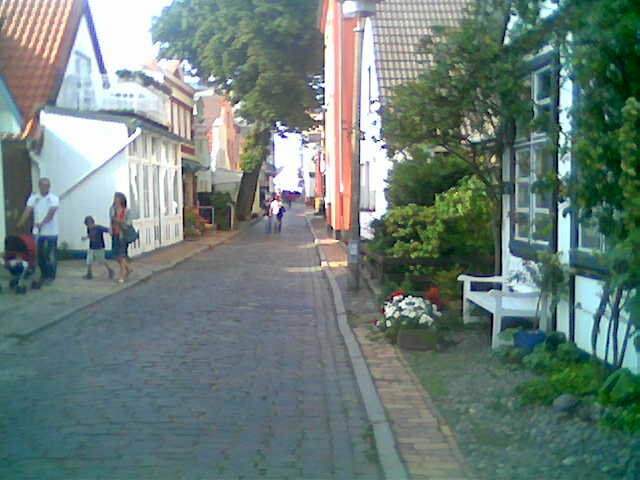 My favorite Rostock run is out along the Baltic sand dunes of this charming vacation town. There is an easy connection from the Rostock main train station, just a 20-minute ride on the S-Bahn. Let's hope that you are there in the summer, like I was, and can jump into the water for a break or two during your beach run. 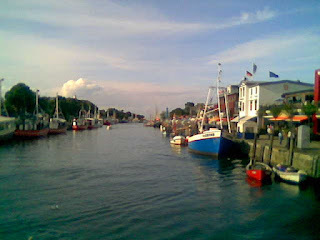 The train station in Warnemünde is right in the heart of this small town, just a block from the main promenade along the old fishing harbor. When you get out of the train, just follow the crowd towards the left (west) and run one block to the bridge over the narrow harbor. This was once the old course of the Warnow River. To the right, the fishing boats and tour boats line the waterfront. The main promenade, Am Strom, lines the water, built in the quaint style of German resort architecture of the 19th century, looking like Dutch colonial houses found in up-state New York and the Cape Town area in South Africa. The street is full of restaurants, shops and vacation apartments. Turn right after the bridge and run down Am Strom. There is one way down low by the boats and another way higher up along the houses, so you can take the one you like best, and both are great. Just keep running straight ahead. Soon the houses will end, and the street turns into a walkway going out onto the harbor mole, with its green harbor light. There's a great view out here of the coast and the cruise ships that seem to constantly glide by. At the end of the mole, turn and run back the same way, but instead of running back into town, turn right at the doorway in the wall along the walkway, and it lets you run westwards, directly out onto the beach. Now you can just run straight along the Baltic water to the west, staying in the fairly wet sand, so the going is not too tough. You are now running right through the pulsing beach scene: families swimming, kids building sand castles, the wicker beach chairs lined up, the caipirinha bars pumping out music. On shore, to the left, you'll see the town with its light-house and hotels. The beach curves straight westwards for about 4 kilometers towards a wooded, sand-cliffed cape. You can make this run as long as you want, really, because the beach continues after the cape for a long, long way. We'll just go to the cape. After just a kilometer, the town basically ends, and the beach narrows. Soon you reach the spot where the woods begins, rising above the cliffs. The jetties end out here and the beach is covered with more and more stones. It's beautiful and natural out here, and a great place to take a swim. You have a choice here: continue running on the beach or to run up along the clifftops in the woods. There are occasional stairs leading up to the cliffs, and the woods are combed with hiking trails. I like to run one way in the sand and run the other way through the woods. Turn around at the cape (or wherever you please!) and it's a straight run back to town. But we haven't seen much of the town itself yet. Zig-zagging along its quiet streets is worth a detour. So when you finally get back to the big Neptun Hotel, run straight into the town (turn to the right), on the street just past (east of) the hotel, Kurhausstraße. After just a block, you'll see the town park on the left. Turn into the park and run through it until you hit Heinrich-Heine-Straße, where you turn right and run for just 100 meters, where you'll come to the church. Just before the church, turn left on Kirchenplatz and run till it ends behind the church, where you turn left on Friedrich-Franz-Straße. These quiet backstreets are full of old holiday houses and a quiet charm that makes you want to slow down and enjoy the scenery. After a few blocks, the street ends in a quiet square, where you need to curve around to the right, and you end up in a bigger square with the lighthouse. Now we run back to the train station by just running straight south on Alexandrinenstraße, which runs parallel to Am Strom. The street heads back towards the church, running into the Kirchenstraße, where you turn left and in just a block you are back at the bridge over the harbor.